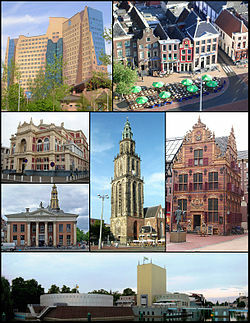 For ither uises, see Groningen (disambiguation). Groningen (Dutch: [ˈɣroːnɪŋə(n)], locally [ˈχroʊ̯nɪŋən]; Gronings: Grunnen; Wast Frisie: Grins) is the main municipality in as well as the caipital ceety o the eponymous province in the Netherlands. Wi a population o aroond 190,000, it is bi far the lairgest ceety in the north o the Netherlands. Groningen is a university ceety, inhabitit on average bi aboot 50,000 students. The ceety wis foondit on the northmaist point o the Hondsrug aurie. The auldest document referrin tae Groningen's existence dates frae 1040. Housomeivver, the ceety awready existit lang afore then: the auldest airchaeological traces foond are believit tae stem frae the years 3950–3720 BC, although the first major settlement in Groningen haes been tracit back tae the 3rd century AD. In the 13t century, when Groningen wis an important trade centre, its inhabitants built a ceety wall tae unnerline its authority. The ceety haed a strang influence on the surroondin lands an made its dialect a common tongue. The maist influential period o the ceety wis the end o the 15t century, when the nearbi province o Friesland wis admeenistered frae Groningen. Durin these years, the Martini Tower wis built, which loomit ower the ceety at (then) 127 metres tall, makkin it the heichest biggin in Europe at the time. The ceety's unthirldom came tae an end when it chose tae join forces wi the Spainyie durin the Aichty Years' War in 1594. It later switched sides, joining the Republic o the Seiven Unitit Netherlands. In 1614, the University o Groningen wis foondit, initially anerlie for religious education. In the same period the ceety expandit rapidly an a new ceety waw wis built. That same ceety waw was testit durin the Third Anglo-Dutch War in 1672, when the ceety wis attacked fiercely bi the bishop o Münster, Bernhard von Galen. The ceety waws resistit, an event which is celebratit wi muisic an firewirks on 28 August (as "Groningens Ontzet" or "Bommen Berend"). Groningen haes a ceul temperate climate similar tae maist o the Netherlands, awtho slichtly caulder in winter than ither major ceeties in the Netherlands due tae its northeasterly position. Weather is influencit bi the North Sea tae the north-west an its prevailin north-wastren winds an gales. Winter temperatures are ceul: on average abuin freezin, awtho frosts are common durin spells o easterly winds blowin in frae the inner European continent, i. e. Germany, Roushie an even Siberie. Nicht-time temperaturs o −10 °C (14 °F) or lawer are no uncommon durin cauld winter periods. The lawest temperatur iver recordit is −26.8 °C (−16.2 °F) on 16 Februar 1956. Snaw aften faws, but rarely stays consecutively due tae wairmer daytime temperaturs awtho white snawy days happen ivery winter. Simmers are somewha wairm an humid. Temperaturs o 30 °C (86 °F) or heicher occur sporadically, maist average daytime heichs are aroond 22 °C (72 °F). Vera rainy periods are common, especially in ware an simmer. Average annual precipitation is aboot 800 mm (31 in). Sunshine oors vary, but are uisually lackin belaw 1600 oors, givin hintle cloud cover similar tae maist o the Netherlands. Thare is local fitbaa club is FC Groningen. The hame stadium o FC Groningen is cried Euroborg. Opened in Januar 2006, the stadium haes 22,600 seats. Thare are plans tae expand the stadium tae capacity o 35- or 40,000. The umwhile fitbaa stadium o FC Groningen is the Oosterpark Stadion (12,500 seats). ↑ "1981−2010 normals at Groningen Airport Eelde (snowy days normals for 1971−2000)" (PDF). Royal Netherlands Meteorological Institute. Retrieved 26 June 2012. ↑ "1971−2000 extremes at Groningen Airport Eelde" (PDF). Royal Netherlands Meteorological Institute. Retrieved 26 June 2012. This page wis last eeditit on 10 Mairch 2018, at 21:09.